Create Make Learn: March 22 - Making can be SEW fun! 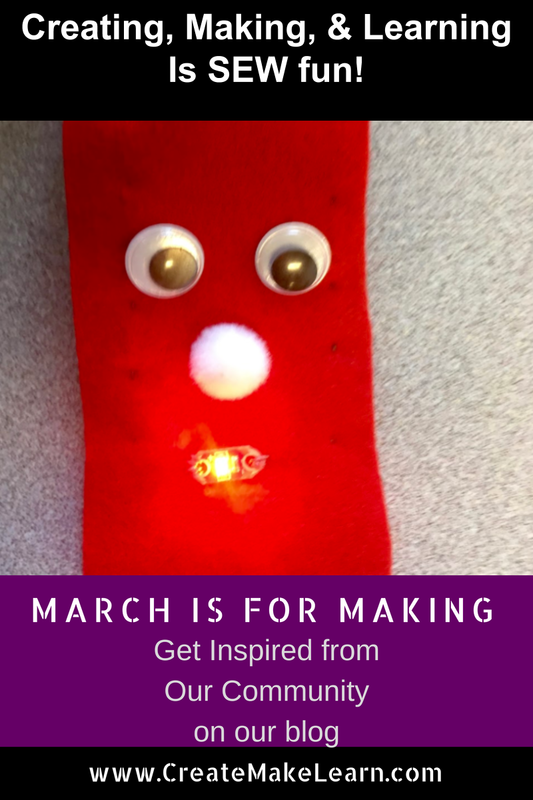 Today’s March is for Making is Part 1 of 2 posts on making with eTextiles. 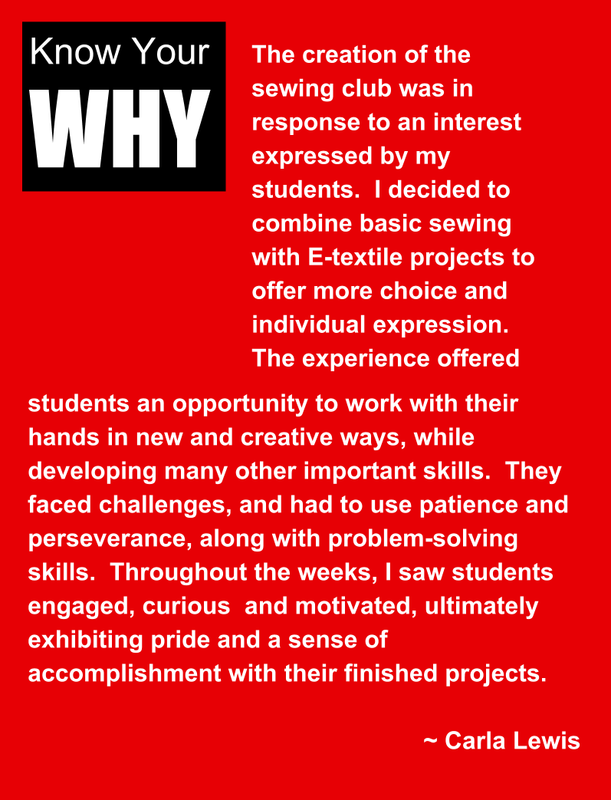 It is from Fayston Elementary teacher Carla Lewis who recently piloted a maker project where her 3rd and 4th grader learned about sewing and eTextiles. 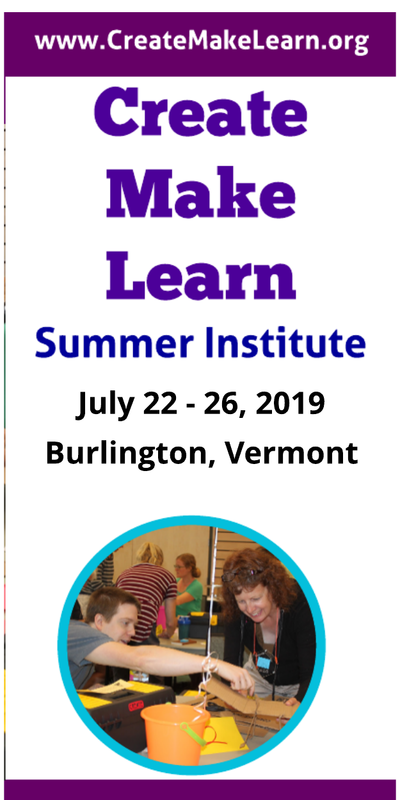 Tomorrow’s post will take a look at some tips and resources from Vermont’s own eTextile guru- Jill Dawson! 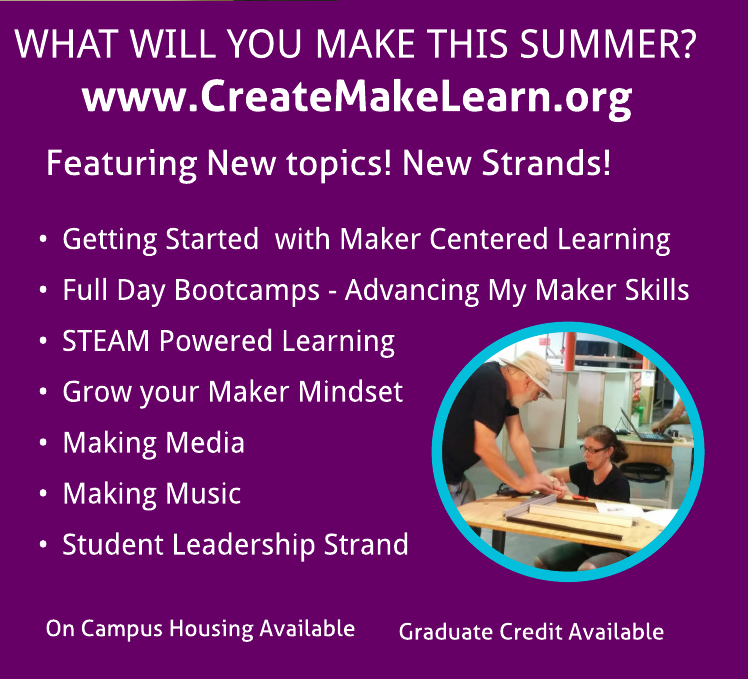 After learning the basics of eTextiles at the Create Make Learn Summer Institute, Carla Lewis was inspired to introduce a traditional skill like sewing along with a STEM infused version of this craft to her students. Sew…… she started a sewing club for third and fourth graders at her school. 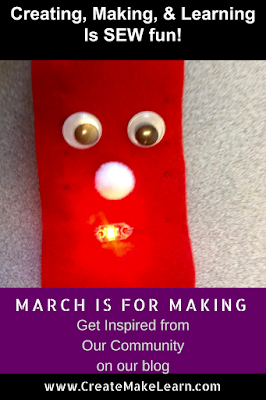 In today’s guest post, Carla shares her experience teaching young learners to sew to and teaching them about circuits through sewing. I had thought about opening it up to other grades, but 21 out of 22 third and fourth graders signed up!!! Needlessly to say, I didn’t need to solicit any other participants. In fact, I had to ask another adult to join me, and our wonderful librarian/technology integrationist, Allison Schlageter, agreed. It took place during their lunch and recess hour, so they were giving up recess to do this. We have an art/makerspace room that we used. They brought in their lunch, and then as soon as they were done, they could begin working. We started with three weeks of basic sewing skills. This included tying knots and threading needles, which proved to be far more challenging then I had realized. They had a choice of simple projects, using either fabric or felt. These included bookmarks, pillows, purses, stuffed animals and cubes, or anything else they wanted to make. Many of them also chose to learn some embroidery stitches to use on their projects. One student drew a detailed picture, which he embroidered and framed. The next phase was learning about circuits, and then designing an E-Textiles project. 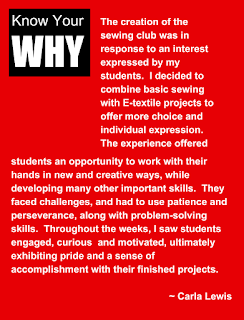 About half of the students decided to continue on and do this, while others either continued to work on sewing projects, or chose not to participate. The first week I had everyone make paper circuits to help them understand how they would have to construct their circuit when sewing. They created a card and we used LEDs, copper tape and coin cell batteries to light up their design. Everyone was successful and excited about the next phase. We spent four more weeks working on their projects. Some of them chose to use their sewing project, rather than create something new. So we had a pig pillow, whose nose would light up when you snapped the two parts of its tail together, and a green monster pillow, with a LED on its head that would light up when he clapped his hands together. Others created new felt bookmarks, and all were delighted when their LEDs actually lit up! The creation of the sewing club was in response to an interest expressed by my students. I decided to combine basic sewing with E-textile projects to offer more choice and individual expression. The experience offered students an opportunity to work with their hands in new and creative ways, while developing many other important skills. They faced challenges, and had to use patience and perseverance, along with problem-solving skills. Throughout the weeks, I saw students engaged, curious and motivated, ultimately exhibiting pride and a sense of accomplishment with their finished projects.